Our love affair with ice cream is centuries old. The ancient Greeks, Romans, and Jews were known to chill wines and juices. This practice evolved into fruit ices and, eventually, frozen milk and cream mixtures. In the first century, Emperor Nero reportedly sent messengers to the mountains to collect snow so that his kitchen staff could make concoctions flavored with fruit and honey. Twelve centuries later, Marco Polo introduced Europe to a frozen milk dessert similar to the modern sherbet that he had enjoyed in the Far East. The Italians were especially fond of the frozen confection that by the sixteenth century was being called ice cream. In 1533, the young Italian princess Catherine de Medici went to France as the bride of the future King Henry II. Included in her trousseau were recipes for frozen desserts. The first public sale of ice cream occurred in Paris at the Café Procope in 1670. Frozen desserts were also popular in England. Guests at the coronation banquet of Henry V of England in the fourteenth century enjoyed a dessert called cremefrez. By the seventeenth century, Charles I was served creme ice on a regular basis. Eighteen-century English cookbooks contained recipes for ice cream flavored with apricots, violets, rose petals, chocolate, and caramel. Other early flavorings included macaroon and rum. In early America, George Washington and Thomas Jefferson were especially fond of ice cream. Dolley Madison was known to serve it at White House state dinners. Because ice was expensive and refrigeration had not yet been invented, ice cream was still considered a treat for the wealthy or for those in colder climates. (In a note written in 1794, Beethoven described the Austrians’ fear that an unseasonably warm winter would prevent them from enjoying ice cream.) Furthermore, the process of making ice cream was cumbersome and time-consuming. A mixture of dairy products, eggs, and flavorings was poured into a pot and beaten while, simultaneously, the pot was shaken up and down in a pan of salt and ice. The development of ice harvesting and the invention of the insulated icehouse in the nineteenth century made ice more accessible to the general public. In 1846, Nancy Johnson designed a hand-cranked ice cream freezer that improved production slightly. The first documented full-time manufacturing of ice cream took place in Baltimore, Maryland, in 1851 when a milk dealer named Jacob Fussell found himself with a surplus of fresh cream. Workipg quickly before the cream soured, Fussell made an abundance of ice cream and sold it at a discount. The popular demand soon convinced him that selling ice cream was more profitable than selling milk. However, production was still cumbersome, and the industry grew slowly until the industrialization movement of the early twentieth century brought electric power, steam power, and mechanical refrigeration. By the 1920s, agricultural schools were offering courses on ice cream production. Trade associations for members of the industry were created to promote the consumption of ice cream and to fight proposed federal regulations that would call for selling ice cream by weight rather than volume, and the disclosure of ingredients. The Prohibition era proved to be very profitable for the ice cream industry. Denied alcoholic beverages, many people ate ice cream instead. Breweries were often converted to ice cream factories, although it is likely that some of the plants were merely fronts for illegal liquor sales. Although the repeal of Prohibition in 1933 and the ensuing depression slowed ice cream sales, the industry continued to grow. The movie industry was especially instrumental in the promotion of ice cream and scenes depicting stars enjoying the frozen concoctions were plentiful. Ice cream parlors sprang up in every town and the parlor employee, the so-called soda jerk, developed into a cultural icon. After World War II, with raw materials readily available again, the ice cream industry produced over 20 qt (19 1) of ice cream for each American per year. During the 1950s, competition sprang up between the ice cream parlor and the drug store that sold packaged ice cream. It was during this time that usage of lesser quality ingredients increased. 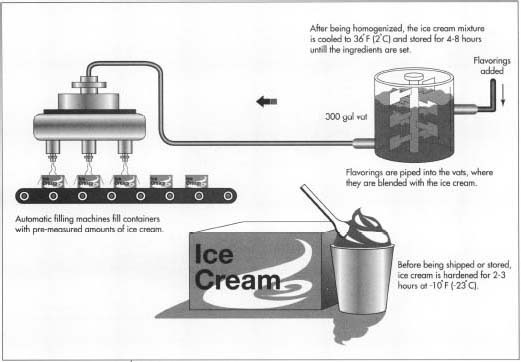 Many producers were adding very low percentages of butterfat and pumping large quantities of air into the ice cream to fill out the carton. The 1970s saw the development of gourmet ice cream manufacturers with an emphasis on natural ingredients. People also became interested in making ice cream at home. Upscale restaurants offer homemade ice cream on their dessert lists. Today, ice cream is made from a blend of dairy products (cream, condensed milk, butterfat), sugar, flavorings, and federally approved additives. Eggs are added for some flavorings, particularly French vanilla. The broad guidelines allow producers to use ingredients ranging from sweet cream to nonfat dry milk, cane sugar to corn-syrup solids, fresh eggs to powdered eggs. Federal regulations do stipulate that each package of ice cream must contain at least 10% butterfat. The additives, which act as emulsifiers and stabilizers, are used to prevent heat shock and the formation of ice crystals during the production process. The most common additives are guar gum, extracted from the guar bush, and carrageenan, derived from sea kelp or Irish moss. Ice cream flavors have come a long way from the standard vanilla, strawberry, and chocolate. By the 1970s, the International Association of Ice Cream Manufacturers had recorded over 400 different flavors of ice cream. In an ever-expanding array of combinations, fruit purees and extracts, cocoa powder, nuts, cookie pieces, and cookie dough are blended into the ice cream mixture. Air is added to ice cream to improve its ability to absorb flavorings and to facilitate serving. Without air, ice cream becomes heavy and soggy. On the other hand, too much air results in ice cream that is snowy and dry. The federal government allows ice cream to contain as much as 100% of its volume in air, known in the industry as overrun. Makers of high-quality ice cream (sometimes known as gourmet ice cream) use fresh whole dairy products, a low percentage of air (approximately 20%), between 16-20% butterfat, and as few additives as possible. Although ice cream is available in a variety of forms, including novelty items such as chocolate-dipped bars and sandwiches, the following description applies to ice cream that is packaged in pint and half-gallon containers. 1 The milk arrives at the ice cream plant in refrigerated tanker trucks from local dairy farms. The milk is then pumped into 5,000 gal (18,925 1) storage silos that are kept at 36°F (2°C). Pipes bring the milk in pre-measured amounts to 1,000 gal (3,7851) stainless steel blenders. Premeasured amounts of eggs, sugar, and additives are blended with the milk for six to eight minutes. of a series of thin stainless steel plates. Hot water, approximately 182°F (83°C), flows on one side of the plates. The cold milk mixture is piped through on the other side. The water warms the mixture to a temperature of 180°F (82°C), effectively killing any existing bacteria. 3 By the application of intensive air pressure, sometimes as much as 2,000 pounds per square inch (141 kg per sq cm), the hot mixture is forced through a small opening into the homogenizer. 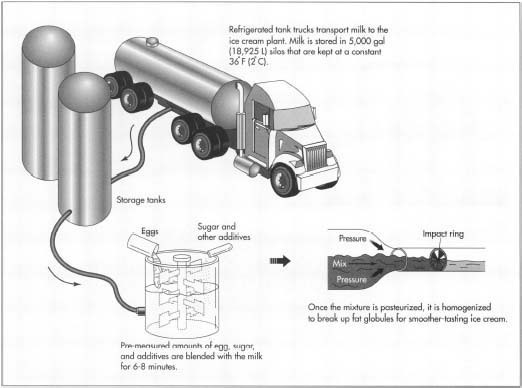 This breaks down the fat particles and prevents them from separating from the rest of the mixture. In the homogenizer, which is essentially a high-pressure piston pump, the mixture is further blended as it is drawn into the pump cylinder on the down stroke and then forced back out on the upstroke. 4 The mixture is piped back to the pasteurizer where cold water, approximately 34°F (1°C), flows on one side of the plates as the mixture passes on the opposite side. In this manner, the mixture is cooled to 36°F (2° C). Then the mixture is pumped to 5,000 gal (18,925 1) tanks in a room set at 36°F (2°C), where it sits for four to eight hours to allow the ingredients to blend. 5 The ice cream is pumped to stainless steel vats, each holding up to 300 gal (1,136 1) of mixture. Flavorings are piped into the vats and blended thoroughly. can freeze up to 700 gal (2,650 1) per hour. The temperature inside the freezers is kept at -40°F(-40°C), using liquid ammonia as a freezing agent. While the ice cream is in the freezer, air is injected into it. When the mixture leaves the freezer, it has the consistency of soft-serve ice cream. 7 If chunks of food such as strawberry or cookie pieces are to be added to the ice cream, the frozen mixture is pumped to a fruit feeder. The chunks are loaded into a hopper at the top of the feeder. Another, smaller hopper, fitted with a starwheel, is located on the front of the feeder. An auger on the bottom of the machine turns the hoppers so that the chunks drop onto the starwheel in pre-measured amounts. As the mixture passes through the feeder, the starwheel pushes the food chunks into the ice cream. The mixture then moves to a blender where the chunks are evenly distributed. 8 Automatic filling machines drop preprinted pint or half-gallon-sized cardboard cartons into holders. The cartons are then filled with premeasured amounts of ice cream at the rate of 70-90 cartons per hour. The machine then places a lid on each cartons and pushes it onto a conveyer belt. The cartons move along the conveyer belt where they pass under a ink jet that spray-paints an expiration date and production code onto each carton. After the imprinting, the cartons move through the bundler, a heat tunnel that covers each cup with plastic shrink wrapping. 9 Before storage and shipping, the ice cream must be hardened to a temperature of -10°F (-23°C). The conveyer system moves the ice cream cartons to a tunnel set at -30°F (-34°C). Constantly turning ceiling fans create a wind chill of -60°F (-5 1°C). The cartons move slowly back and forth through the tunnel for two to three hours until the contents are rock solid. The cartons are then stored in refrigerated warehouses until they are shipped to retail outlets. Every mixture is randomly tested during the production process. Butterfat and solid levels are tested. The bacteria levels are measured. Each mixture is also taste-tested. Ice cream producers also carefully monitor the ingredients that they purchase from outside suppliers. Ice cream manufacturers continue to develop new flavorings. Ironically, given the industry’s experiences during Prohibition, one of the more recent innovations has been the introduction of liqueur-flavored ice creams.